Also a contender for worst place to put duct work ever. Why the hell there are ducts in peoples attics boggles my mind. The attic gets extremely hot in the summer, and extremely cold in the winter. Doesn't take a genius like me to figure that out. Thus the air return duct going through the ceiling upstairs then goes through the attic for a good 12 feet before shooting straight down to the air handler, essentially exposing the air to whatever environment happens to be in the attic at the time. Coincidentally, that environment is exactly the opposite of the temperature you are trying to achieve in your house. 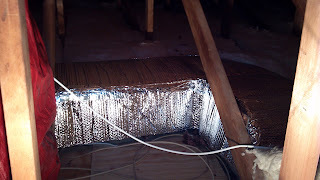 So while insulating the attic, I decided trying something was better than doing nothing, and added some of this Mylar bubble wrap to the top and sides of the duct (couldn't get to the bottom). You just leave the old, pathetic looking, fiberglass insulation on. It should reflect heat away in the summer, and keep heat in in the winter, I hope. It looks cool, and was easy to use. Plus, I got to use the best duct tape ever. Screw the people who came up with this idea.